For a Toronto wedding photographer, shooting weddings at One King West hotel is a pleasure and a significant challenge. I love that the hotel has plenty of locations where one can take great photos on a wedding day. Among them, The Vault, The Fifteen Hundreds and the Grand Banking Hall are only a few of the spots I recommend for amazing wedding pictures in the hotel. The challenge, for a wedding photographer is how to stay fresh after shooting every weekend at the same venue. For me, a photographer who does weddings at this wedding venue on a regular basis, the solution is to see the venue with a fresh eye every time the artist shoots there. This intimate portrait of the bride and groom was taken during the wedding reception that occurred in the Grand Banking Hall. In my wedding photography career, I learned that couples would rather enjoy the party then spend a long time taking night pictures. As such, even before the wedding I scout the location and right down the best spots for indoor wedding photos. In this case, that place was right in front of the entrance to the Grand Banking Hall. Here, I simply asked the bride and groom to hug and look at each other. Regardless of the amount of time I'm being offered, the results have to be outstanding. After all, a few months after the wedding chances are that the couple will forget the circumstances under which we took their wedding photo, so it is only the result that matters. As such, the main principles of art and composition if you want should be second nature for a professional wedding photographer. Here are a few of them present in this image. The bride and groom are positioned at the bottom left of the picture (shot in the landscape format) and are perfectly balanced by the chandelier placed on the top right side of the frame. 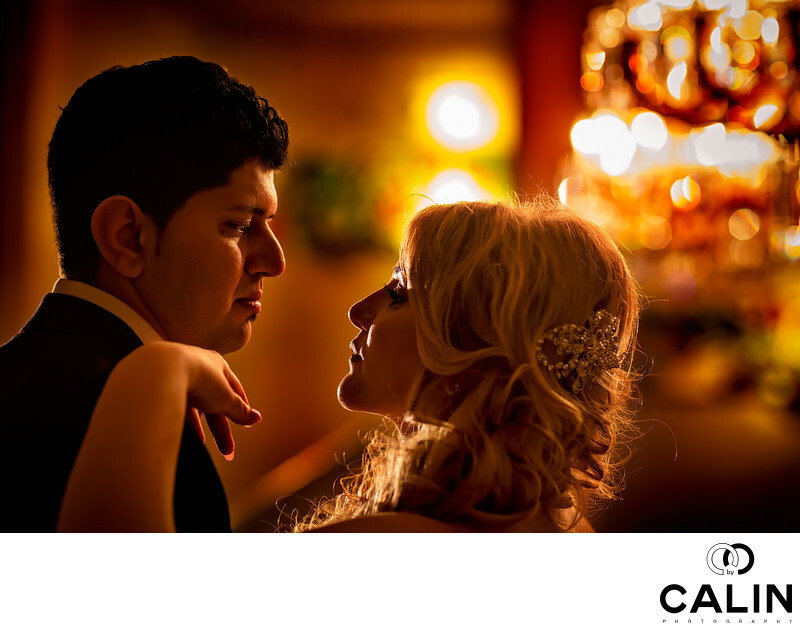 The couple is backlit, which creates a striking contrast with the chandelier. To match the tungsten chandelier light, I used a continuous source of light, more specifically the Lowel GL1. To set the right balance properly and camera I dialled a 2800 Kelvin light temperature. Although this image looks very complicated and carefully choreographed, it took me no longer than two minutes to create. I obviously have to give credit to the newlyweds who followed closely my directions like two professional actors. I remember this wedding perfectly. After this image, we went to two different spots in the main lobby and I took about 5 to 10 pictures that made it to the wedding album. That is a testament of the beauty of this wedding venue. In terms of colour scheme, this is a an orange photograph, a very appealing combination of complementary colours. I specifically used a Canon 85 mm 1.2 lens shot wide open so that I can get a beautiful bokeh of the chandelier lights in the background. In post processing I had a simple job: dodged and burnt the image so that I reduced the exposure of the chandelier to draw attention to the married couple. Location: 1 King Street West Toronto, ON M5H 1A1 .